I like the idea of artist run centres that work collaboratively to give creators more control of their work. It’s comforting to knowing that there are places and possibilities in Toronto for artists to thrive. I also like the idea that you have to build your ground before you step on it. I’m in my final year at OCAD and went to highschool in the Kawartha area. I’m currently working at a speciality grocery store called Fresh & Wild in the Bloor west village. Is there something you’re scared or worried about? I go to an arts school, so of course I face the stereotype of the ‘art school dropout’. But I will continue with fine arts, likely in curatorial work. I’ve also considered a master’s degree but probably won’t live in Toronto immediately afterwards. I have other outlets that I want to pursue before I settle down. Why are you carrying around empty crates? I’m setting up my studio space; it’s my desk. My work is primarily object based, such as antiques. I also make prosthetics. 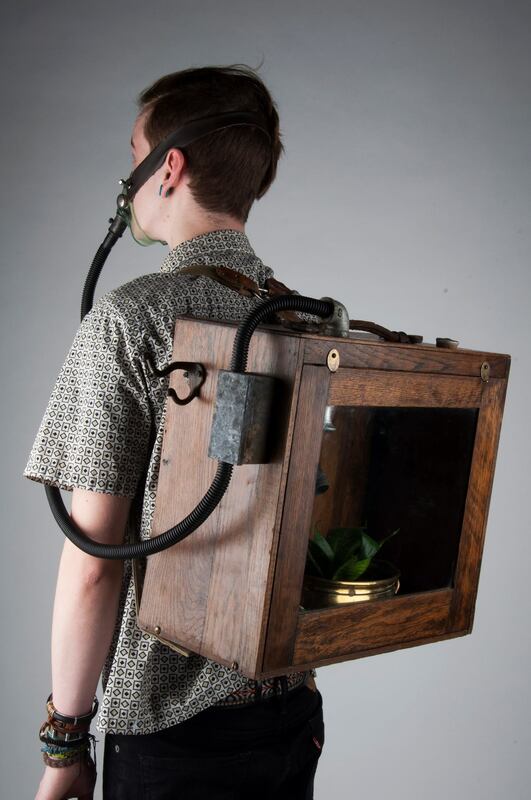 For instance, I made a knapsack with a plant in it so you’re breathing fresh air. What’s the happiest moment you can remember? I would go back to childhood, I suppose. I don’t want to leave you with the vagueness of nostalgia, but I would say just playing as a kid; that free spirit that kids have. Now there are rules, expectations and routines to comply with. If you could see into the future or past, which would you chose and why? I would say the future. I have already experienced my own past, so if what I can remember now is important, then why go back? Is there a place or thing in Toronto that you feel connected to? I want to say downtown in general just for the idea of the art scene. That’s why I like Toronto so much: the prosperity of potential. To put a pinpoint, I would say Queen west. I’m interested in the galleries there. I like the idea of artist run centres that work collaboratively to give creators more control of their work. Even though art is an exclusive zone, these galleries enable new and emerging artists to step into that ‘exclusivity’. It’s comforting to knowing that there are places and possibilities in Toronto for artists to thrive. Is there something you’re looking forward to? Dreaming about? I’ve never travelled, so i’d love to do that. It would be nice to say that i’m an international exhibiting artist, but for now I’ve just began to gain attention at the national level. I had a show a couple months back and I just finished a show at the Ontario Science Centre. I was featured in a magazine called Broke, a new publication that showcases emerging artists. I’ve also done some set designs for Vogue Italia. Of course it would be great to have a private practice, but the goal for me would be to open a gallery of curated work. I like the idea that you have to build your ground before you step on it. Want more? See Sheldon’s past projects and Facebook page.